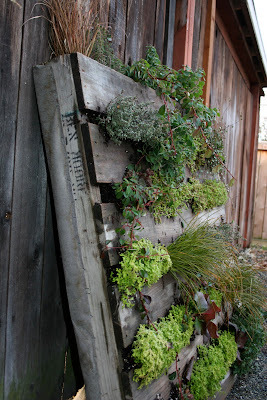 A few months back I stumbled across this awesome idea to turn a shipping pallet into a vertical planter on Fern Richardson's blog. Is Fern not the best name for a gardener? I'm secretly jealous. A few weeks ago I took the time to make one myself, and I'm super excited about how it turned out! I LOVE the beauty and feel of living walls, and of course I'm all about reclaiming waste materials and turning them into something truly special, so this was definitely the project for me. Most pallets get used over and over again, but those that are broken or damaged cannot be used for carrying heavy things with a forklift anymore. These are the ones you want to get. I got a broken pallet while I was picking up some compost at Sawdust Supply, but I sometimes see them in parking lots behind big stores like Best Buy and Costco. I'd ask before taking one... especially to make sure it's not still being used. Fix your pallet if it needs it. Make sure there are no nails poking out that need to be hammered back in, big splinters that need sanding down, or loose boards that need to be secured. Decide which side of your pallet will be the front, and which will be the top. The front should be the side with narrow slats (no more than 4 inches). Line the back, sides, and bottom of your pallet with a double layer of landscaping fabric. Pull the fabric taut across the top edge of the pallet, without covering the opening at the top, and using a staple gun attach it to the pallet. Put staples in every 2 inches. Then continue down the sides and the bottom like you are wrapping a present. Remember to make everything neat and tidy so it will look nice. Landscaping fabric stapled along the top edge of the planter. Notice that the opening is still free to plant in. 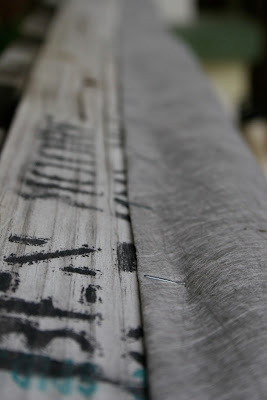 Landscaping fabric stapled along the vertical sides of the planter. the front side. This way it will be less noticeable when planted and upright. This was the hardest part of the whole project for me, but it really wasn't very hard at all. Don't cover the top of the slats on the front of the pallet, as you will plant these areas. With your pallet lying on its back, fill it with potting soil and compost through the slats in the front. I like GroCo compost a lot, so I like to add it to all my potted plants along with a light potting mix, like Gardner and Bloome's planting mix. My pallet was 3.5' by 3.5', 6" deep, and I used about 3 cubic feet of soil all together. You really want to pack this stuff in tight! Make sure the entire planter is filled with soil. will fall to the bottom when you turn it upright. Do this to figure out the pattern in which you want to plant them. This part is sorta like painting. I tried to cluster types of plants, and went for a variety of contrasting textures. I moved things around a little bit until I was happy with how it looked. I tried a few arrangements before I got the plants how I wanted them. Plant from the bottom up. Make sure that your plants are packed in there really tight! I found that I needed to add more soil as I planted because I kept on pushing soil down towards the bottom. You want the plants to be snug so that no soil or plants fall out when you turn the pallet upright. Don't plant the very top yet! It will be hard to wait, but this will allow roots to establish and will keep soil and plants from falling out the front. Yahoo! Now that your plants have had a couple weeks to establish, you can turn it vertical by leaning it up against a wall. At this time you should plant the very top of your pallet. I added a tall grass in the corner for a little verticality, and because I thought it looked fun. I also added more wintergreen because I love the way it looks trailing down across the lines of evenly spaced plants. These types of planters tend to dry out quickly. Once our rainy season ends (will it ever end?) it will likely need to be watered every other day. Water by using a gentle spray to irrigate through the top, and also give it some water from the "front" (i.e. try to spray directly into the slats). I'm hoping that the fact that I planted hardy drought-tolerant succulents, herbs, sedums, and grasses will serve me well through the summer. Thanks Fern for the inspiration! p.s. Looks like the ladies at design*sponge were also inspired by this project. What an awesome idea! Yours turned out perfect! i really love this. i wonder if succulents will do ok in partial shade, so that it doesn't dry out in our hot summers. i'll have to play around with it. thanks for such a great idea! Your pallet garden is beautiful! Jesse and I tried many times to do this project last summer, but we just never had enough time (oy wedding planning). This is the summer of the pallet garden! Your steps are so clear...this post will be our guide for sure! What a cool idea! I'm going to do it with strawberries for sure! Great for a lettuce/ herb garden for a friend of mine in a wheelchair. So beautiful and eco friendly. Thank you for this!!! 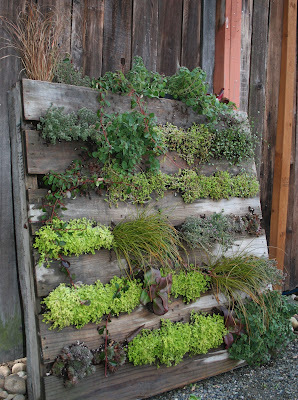 I'm definitely doing this with herbs, although some pallets are treated with chemicals; it's best to make sure you get untreated ones for edible plants. Let's face it: any party---be it a simple children's birthday celebration or an extravagant wedding party---wouldn't be complete without a lovely cake, the most popular dessert of choice for festivities. Over the years, pastry baked recipe and bakers have creatively improved cakes in order to match them with a certain event theme, or make them unique in their own way. What do you need to start a baked recipes The idea is great; the products are often out of this world, and cheaper than what you could get from a professional bakery.